A couple of weeks ago I sent Dr. Bill a couple of Mastock newsletters. He send me Lab Findings # 6 (his most recent issue). I loved it. 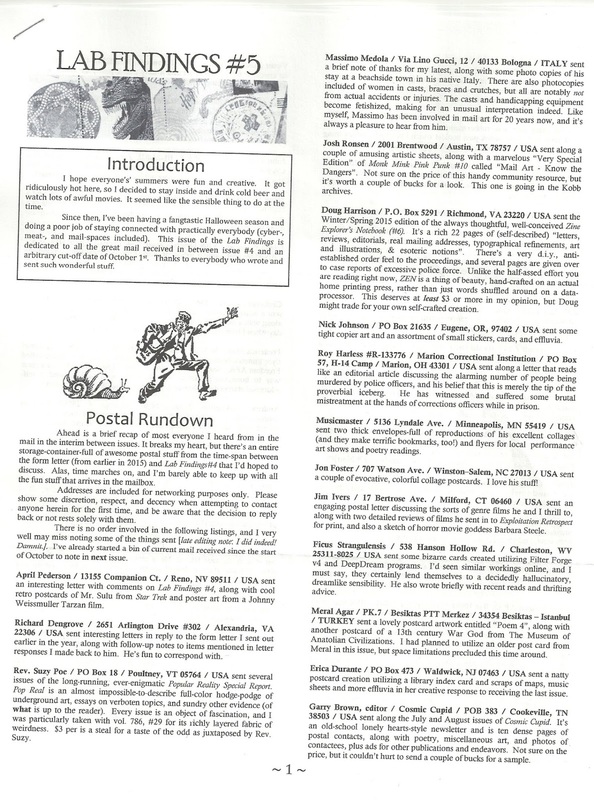 I reviewed it, and I sent him more copies of the Mastock newsletter. I got a small parcel last night. The good doctor Bill didn`t have time to finalize LF#7 so he send me issue #5. This one is a 8.5 by 11, black & white, printed zine (6 pages this time around). 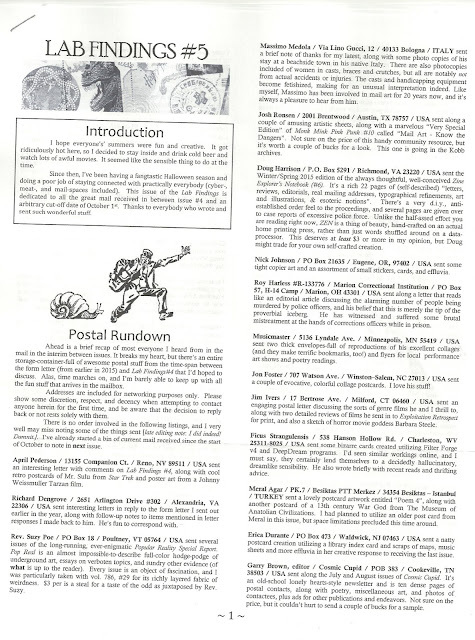 Let`s start with the postal rundown section. It is a huge list of mail contacts (44 to be precise) for mail art, collage artists, homemade postcards, traders, and some zines as well. There`s also the letter comment section. While reading this I discovered I`m not the only one who likes shopping at thrift stores. I purchased some rare, cool and cheap CDs / DVDs there. I bought in no particular order; A- Best of Troma Dance Volume 4 DVD = 4.00$ B- The Throne Of Drones Compilation CD = 2.00$ (sold out and rare). -C-DJ Spooky That Subliminal Kid ‎– Necropolis: The Dialogic Project CD = 0.50 (my favorite illbient / electronic album).